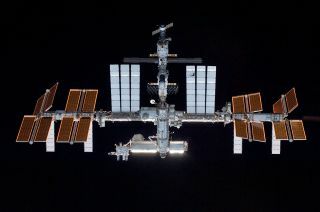 The malfunction of a vital cooling system on the International Space Station could delay plans to launch a privately built cargo ship on its first official delivery mission to the orbiting lab next week, NASA officials said today (Dec. 12). The space station malfunction occurred Wednesday (Dec. 11) when a coolant pump shut down, affecting half of the orbiting laboratory's cooling system one week before the planned launch of a commercial Cygnus spacecraft by the company Orbital Sciences. That mission, called Orbital 1, is slated to lift off Dec. 18 from Wallops Island, Va., to deliver fresh supplies to the space station. "This is clearly an issue we need to deal with in its entirety before we commit to the launch of Orbital 1," Kenny Todd, head of NASA's space station mission management team, said in a NASA TV update today. "We're committed to doing that, and I think giving the team an extra day or so to think through what ways we might recover enough of the functionality to get comfortable with the launch is going to be our best course of action." The International Space Station uses liquid ammonia to cool systems inside and outside the orbiting lab. That ammonia coolant is moved through cooling lines via pumps. On Wednesday, one of the two pumps shut down after it registered lower than normal temperatures. Space station engineers suspect the problem is related to a flow control valve inside the pump and are attempting to diagnose the issue from the ground by commanding the valve to move through its various positions. If the flow control valve issue continues to be a problem, it might require the astronauts to take a spacewalk outside of the station to fix the valve. Critical systems on the station are still up and running, but some secondary systems have been shut down, according to NASA. The space station's second cooling loop, Loop B, is still functioning normally. "We haven't lost any primary functionality," Todd said. "This is a position we don't want to be in long term and so the team is continuing to work through the fault tree of what might be going on with this particular flow control valve." In the meantime, Orbital Sciences officials are working to prepare for the upcoming Cygnus launch. Orbital has a $1.9 billion contract to provide eight cargo delivery mission to the space station for NASA using its unmanned Cygnus spacecraft and Antares rockets. Orbital launched the first Antares rocket test flight in April, and followed that success with a demonstration flight of the Cygnus spacecraft in September. The planned Dec. 18 launch of Cygnus from NASA's Wallops Flight Facility in Virginia will mark Orbital's first official cargo run. Orbital Sciences is one of two private spaceflight companies with a contract to deliver cargo to the International Space Station for NASA. The other company is the Hawthorne, Calif.-based SpaceX, which has a $1.6 billion agreement to fly 12 cargo mission to the station for NASA using its robotic Dragon space capsules and Falcon 9 rockets. Two of those missions have already flown. Editor's note: This story was updated to correct the description of the system malfunction at the top of the story at 1:40 p.m. EST (1837 GMT).